For one guy and a trombone, the opportunities for public music-making are few -- no matter how good the guy is or how shiny the trombone. Put the guy in a band, though, and he can indulge a love for music that otherwise might have gone unrequited after high school or college. This is why Kit Smith has played with the Honolulu Community Concert Band for 33 years and why Thomas Hesch directs the band now. Both play the trombone, by the way. "Not to play my horn is something I can't imagine," Smith says. " It's a very important part of my life." "I enjoy playing music," Hesch says. "It doesn't matter if it's professionally or with a group of people like this." "People like this," meaning volunteers who gather weekly to keep up their chops and be a part of a musical adventure, from Christmas carols at the mall to symphonic repertoire in a formal concert setting. Speaking of which, the band's annual Spring Concert takes place Sunday, a precursor to the band's first-ever tour -- a trip to Australia and New Zealand in June. "We've never even been to a neighbor island, much less another country," Smith says. They leave June 14, to perform in band festivals in venues including the Sydney Opera House. Sunday's concert will preview their road act. 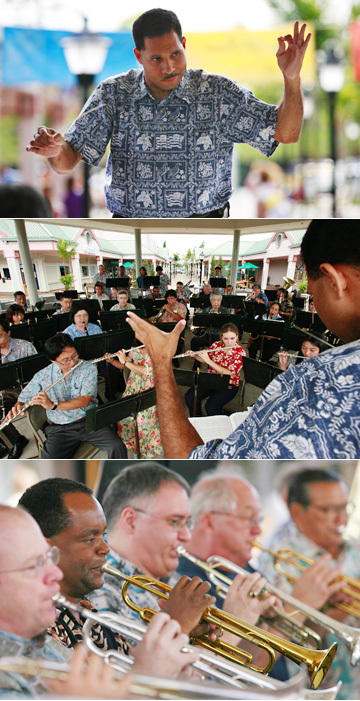 Conductor Thomas Hesch led the Honolulu Community Concert Band during a performance at the Town Center of Mililani Sunday. The volunteer band will be going on tour to Australia and playing at the Sydney Opera House. Band members include Whitney Haugen on timpani; trumpeters Stephen Culpepper, Eliot Maker, Mark Minasian, Tim Gruber and Wilfred Goto; and Ray Moody on tuba. Now, when you imagine "band music," you might be thinking along the lines of "Hilo March" -- and yes, that chestnut is on the program. But so is Dmitri Shostakovich's "Festive Overture" and the "Morceau Symphonique" by Alexandre Guilmant, featuring guest soloist Don Immel, principal trombonist with the Honolulu Symphony Orchestra. And this brings us full circle in terms of the band's history. Hesch says soloist Immel was named after his father's good friend, Don Morosic, the band director at Punahou School who founded the Honolulu Community Band in 1973. Smith, a retired Honolulu Advertiser reporter, remembers the band's first rehearsal in the Punahou band room. "Right from the start we had a pretty good-sized group." 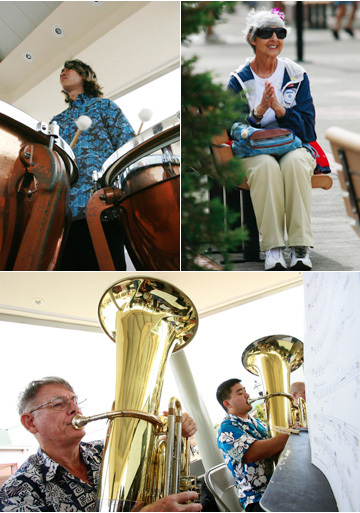 The band now numbers about 50 from all over the island and of varied musical backgrounds. Hesch joined the community band 10 years ago and has directed it for four. He's been making music since Pearl City High School, and these days teaches music and performs part-time with the Royal Hawaiian Band and the Honolulu Symphony. Most of his band members, though, packed up their instruments when it came time to punch a timecard in the real world. "We have people who gave up their instruments for decades and came back after they found out about us," Hesch says. "Because they never gave up their love of music."